Complete lecture summaries for 2014 F295 Speakers will be posted soon. Until then we’ll continue to update this page as information becomes available. A photograph is like a small time machine sent into the future. History is constructed of these fragments and our interpretations of them. The images of Edward Bateman take the form of discovered, historical artifacts that he uses to reveal little know chapters in the history of photography. His extensive use of 3D digital modeling allows him to create metaphorical structures in the form of (often) tangible objects; and by imagining the inventions of others, he becomes the inventor himself. In his series Mechanical Brides of the Uncanny, he uses automatons to recall that moment when, for the first time in human history, objects of our own creation were looking back at us. 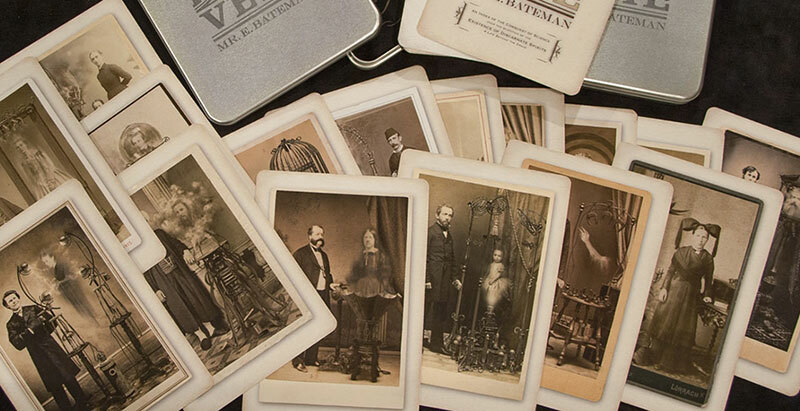 In his latest body of work, Science Rends the Veil, he re-examines and reconstructs the history of 19th century spirit photography, and its quest to find tangible proof of life after death. The camera does indeed let us see the dead again – not as ghostly manifestations, but as meaningful and precious documents of those who once lived. Binh Danh will present an evolution of his studio practice from making photographs on actual leaves (chlorophyll prints) to silver plates (daguerreotypes). In the making, he explores photography’s relationship to memory and landscape. Jefferson Hayman will discuss how the themes of nostalgia, common symbols, and memory are each motifs that help him forge a unique visual sensibility. 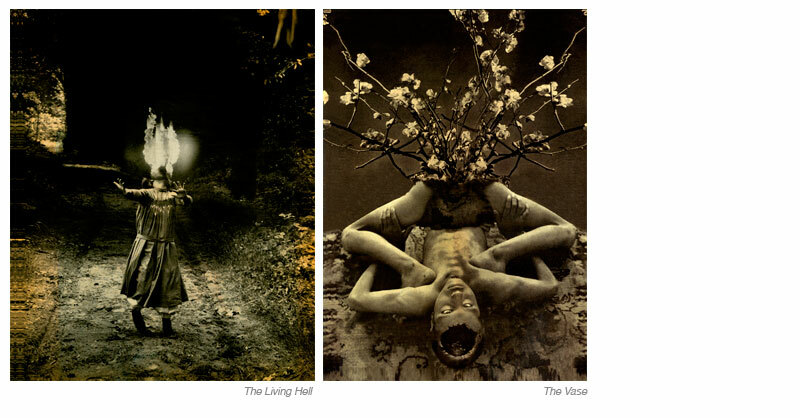 His images are produced with a delicacy of tonality that harkens back to the highest traditions of graphic art. This fabrication creates the illusion of a timeless existence that is beyond linear history. At completion each piece finds realization as a unique statement through thoughtful pairing with an antique or artist made frame. Hayman will discuss his entire process, from start to finish and how each step is informed by the larger goal and vision that we all inhabit a place that is somewhere like this. Dan Herrera will present his current body of work, which indulges his fascination of science fiction within the scope of historical photographic printing methods. He will illustrate how he employs the aesthetics of large-scale 19th century gum-bichromate printing as a means to absorb the viewer in a narrative both futuristic and nostalgic. Herrera uses an elaborate system combining dioramas, props, and digital post-production, adding gestural effects in the final stages of development. This unique process produces prints that are both rich in content and physical surface quality – blurring the lines between photographic realism and painterly illusion. We are artists whether we choose to be or not. It has nothing to do with “talent.” It is a priesthood, a faith that we are naturally a part of by the mere fact that we are human beings. It is a religion fueled by our innate curiosity to understand the mystery of existence. Painting, photography, collage, poetic writing—each medium plays a part in giving definition to the larger picture. The art made being simply molecules of a single object—the mission to materialize this object, to bring it into its own light, giving flesh to the infinite. 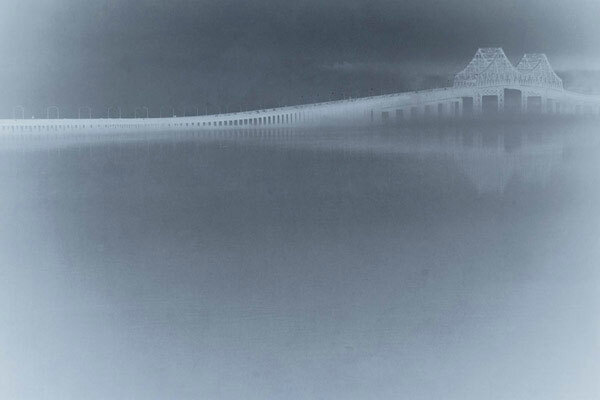 For over forty years, Bea Nettles has used various approaches to photography including mixed media, alternative processes, black and white, dye transfer printing, and artist’s books. Her themes have been consistently autobiographical and narrative. The focus of this lecture is Nettles’ use of photography’s unique abilities to reveal the passage of time and a sense of place. 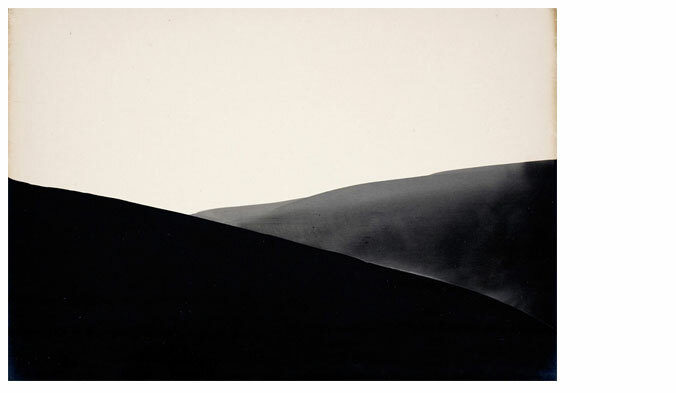 She will share Turning 50, featuring combinations of her black and white photographs with text that contrast her body with a familiar landscape, and thoughts about her past, present and future. Next shown will be Seasonal Turns, four booklets that feature photographs laid out in evocative combinations. Composite images formed the basis of a decade long body of work, Return Trips reflecting on her travels to Italy, Spain, Morocco, and several states including North Carolina, Maine, Illinois and Florida. She combined these images with portraits and glimpses of her daily routine expressing time’s layered and cyclical nature and the sense of place and memory that she has experienced more strongly as the years pass. 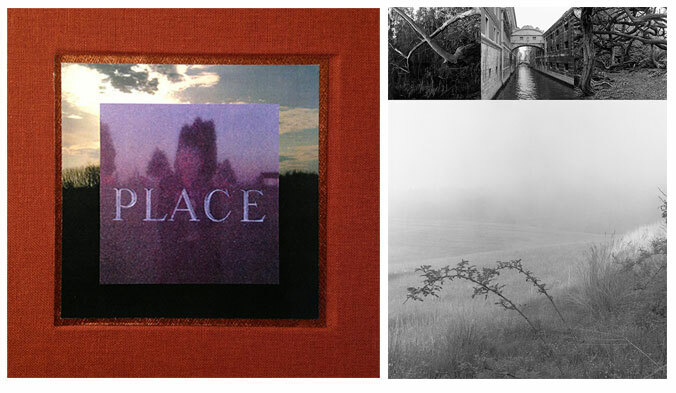 Stonecipher: A Book of Seasons and Place are recent poetic works that utilize her cell phone photographs of surnames that are parts of speech found on gravestones throughout the USA. The four seasons are the subject of Stonecipher. Place contains four pieces she has written about American history and regions: the North, South, East and West. 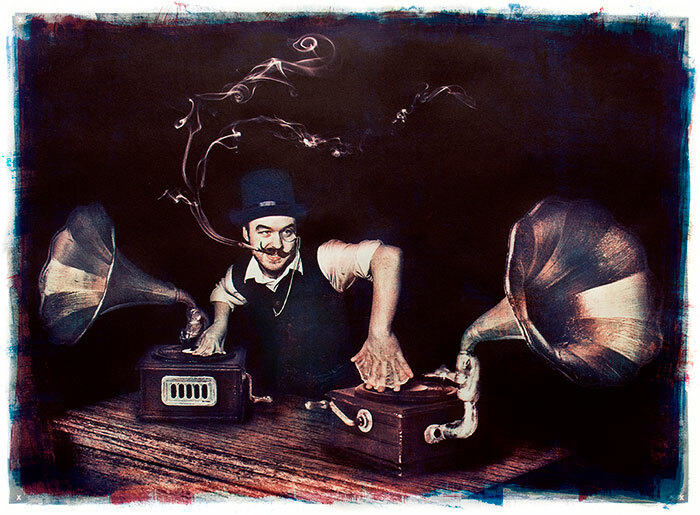 Always inventive and curious, Nettles continues to blend new ways of communicating ideas (digital and digital printing) with one of the oldest, poetry and the spoken word. Expired silver gelatin photographic paper from the late 19th and entire 20th centuries becomes the resource for new art production. The action of time and circumstantial damage create latent imagery. Selective development brings magnificent photographic materials back to life. 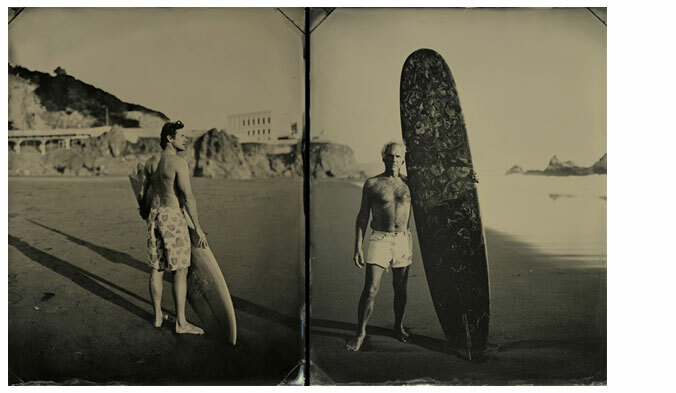 SurfLand is an ongoing series of contemporary portraits of surfers using the historic wet-plate collodion process. This talk explores the culture and geography of these wave-riding voyagers who repeatedly set off on an epic journey. In the tradition of anthropological photography, Surfland explores questions of identity within the larger culture of surfing. Fascinated by the physical and poetic way that surfers inhabit their watery landscapes, the pictures attempt to capture the spirit of freedom and adventure so intrinsic to the American psyche.